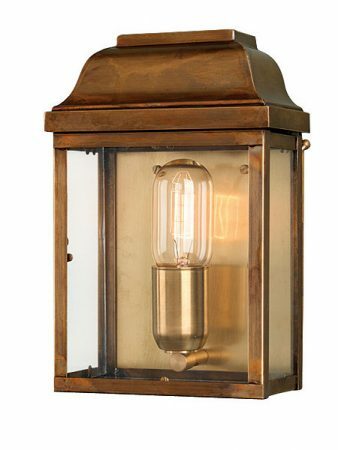 This Elstead Victoria solid aged brass outdoor wall lantern is rated IP44 and handmade using original designs from the pre-Georgian era. Hand finished for a totally authentic weathered look. Featuring a hinged door for easy lamp replacement and clear glass panels. Mellow brass back plate for a warm inviting light and curved roof. The entire shape of this quality lantern closely resembles the flush style of post boxes embedded into stone walls. This classic light is supplied by Elstead Lighting, a British company that specialise in the manufacture and distribution of quality decorative lighting such as the Victoria solid aged brass outdoor wall lantern and rated IP44 you see here.